Now you can get rid of rust forever with Rid O' Rust Family of Products. The Rid O' Rust Family of Products offers a perfect solution to owners of well-based sprinkle systems. Our Family of products will facilitate you enjoy stain-free irrigation. The Rid O' Rust Family of Products is designed to give you the finest-looking yard or landscape on the planet - with a minimum of work and expense! Our products remove ugly stains, prevent them from coming back, and stop mineral scaling too. Forever. Remove existing stains in just minutes with our spray-on Rust Stain Remover. Prevent rust stain from returning by installing one of our easy to use feeder systems and introducing our Rust Stain Preventer Formula into the sprinkle water. Fertilize at the same time by adding our environmentally friendly GrassSoGreen ® product to the water. See for yourself what the Rid O' Rust Products can do for you. Well Water Filtration Systems : Specialty Water Filtration Systems design to remove specific contaminants like iron, sulfur, manganese, balance Ph and more. Rid O' Rust Feeder Systems: Select from our Siphoning or Injection Feeder Systems and combine them with stain removal and stain preventer for stain free irrigation. 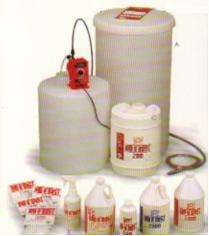 Stain Preventer: Don't let the stains come back with Rid O' Rust Stain Preventer. Stain Removers: Eliminate existing stains with Rid O' Rust Stain Remover. Fertilizers : Keep your grass green with GrassSoGreen ® Fertilizer. Water Test Kit: Do it yourself water test kit to help you determine what formula to use.